Frequently compared to Vancouver, Toronto may not be as scenic, but that doesn’t mean you should overlook this city on your Canadian holiday. Our Worldwide Operations Specialist and former Toronto resident, Emma-Louise, reveals a few of her must-do’s for anyone visiting this vibrant city. Visit Toronto at any time of the year and you’ll find plenty to do and see, and it’s always worth a return trip to see how the seasons change. For six months of the year, Toronto is covered with a wintry blanket of snow, but for the rest of the time it can be as hot as a sunny break in Spain. Autumn is stunning with different colours of maple leaves on the trees. I might be biased because I used to live there, but that means I can also give you some tips on what to see and do in my favourite city. Rain, sun or snow, the CN Tower is without question the most iconic place to visit in Toronto. It was previously the world’s tallest free standing structure, only being eclipsed in 2010 by Burj Khalifa in Dubai. Celebrating a special occasion? Try the revolving restaurant with 360 degree views over Toronto. If the glass floor and the 58 second lift to the top just aren’t enough thrills for you, you may want to try the Edge Walk. Not for the faint hearted, 356m above the ground, you can walk on a 1.5 m wide ledge encircling the top of the Tower’s main pod. 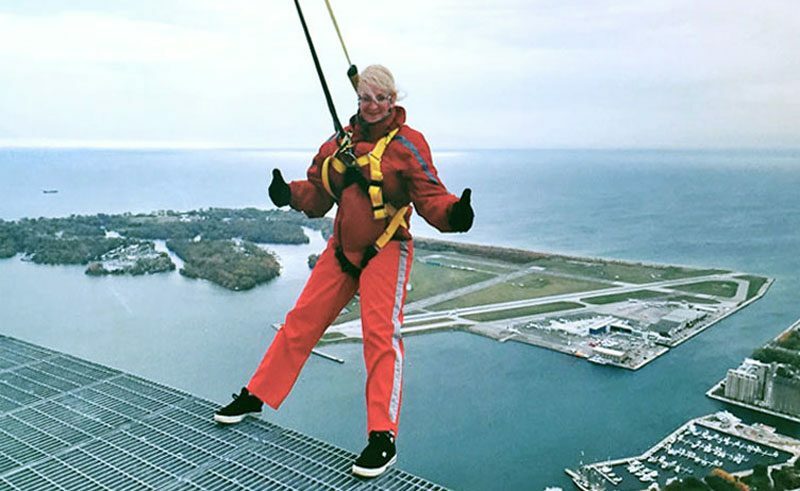 You have the chance to lean back out over the city, put your toes over the edge, and walk along the edge, you’re encouraged to do this by your guide but none of these activities are mandatory! I felt very safe up there, despite it being windy, due to the security in place – your harness will be checked by 4 different staff members and you have two ropes attached to you – any sudden movements and one of these will lock you into place so you won’t be able to move! At the end you’re given a pack with photos and videos – you also get a certificate for being a Guinness World Record Holder! 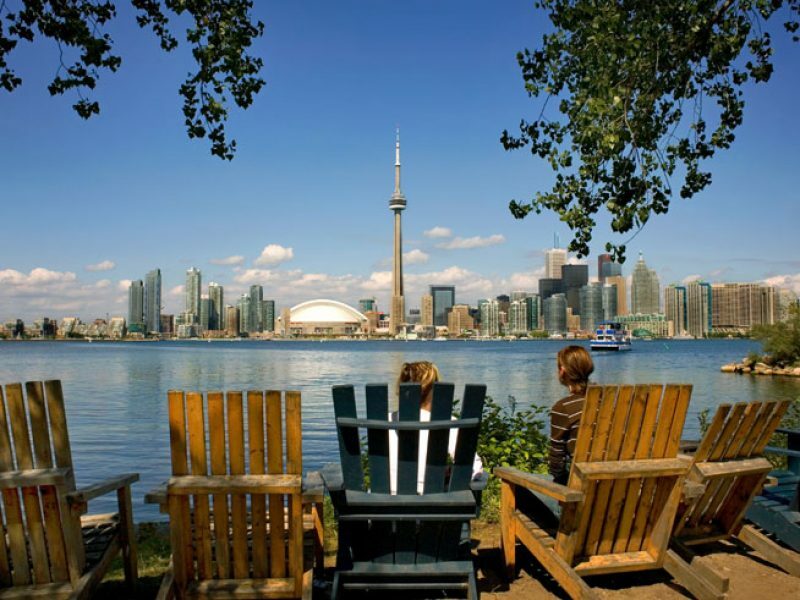 Toronto is great in all weather – and when it’s summer you can pop to the beach! Yes, Toronto has beaches, 11 of these are designated swimming areas. Woodbine is the most popular, the best for beach volleyball and features an Olympic swimming pool, but I like the waterfront at Bluffers Park. Not only is it probably the best kept of all the Blue Flag beaches in Toronto, but you can also spot monarch butterflies during their autumn migration and it’s definitely the most scenic spot, surrounded by the Scarborough Bluffs. If there’s one place you stop for a snack in Toronto, make it Future Bakery. Located on Bloor and Brunswick, it’s the perfect place for tea and cake after a hard day’s shopping. The cakes are freshly baked and there’s a huge selection of flavours – I like the mango and raspberry cheesecake, the raspberry blast and the chocolate banana cake. I don’t even like cake, and I always make sure to visit when I’m in Toronto, which speaks volumes about their baked goods! They also have a huge selection of teas, coffees and hot chocolate – pumpkin spice latte and toffee apple latte were the specials when I was last there, just a few weeks ago! I also recommend visiting The Islands if you’re there in summer. Around 5km long and surrounded by Lake Ontario, there’s lots to do and see and you can also get the best pictures of Toronto’s skyline from here! Heard of Frisbee golf? You can try it here! As no cars are allowed on the island, also hire a bicycle (quads are great for more than 1 person) – the bike rental place is quite far from the ferry dock and you will need to walk there to hire, so consider hiring a bike for the fun of it rather than an alternative to your legs! Toronto Islands is a great place for a picnic, but even if you don’t bring your own there are restaurants here so you won’t go hungry. My favourite thing on a Saturday morning was to get a smoothie from Freshly Squeezed in the Eaton Centre and walk to the ferry terminal, crossing on the ferry to the islands (around 10-15 minutes). Toronto is also a great base for day or weekend trips. The new UP Express GO Train is the easiest and quickest way to get downtown from Lester Pearson airport, it will take you there in 25 minutes and you can even pay on board. 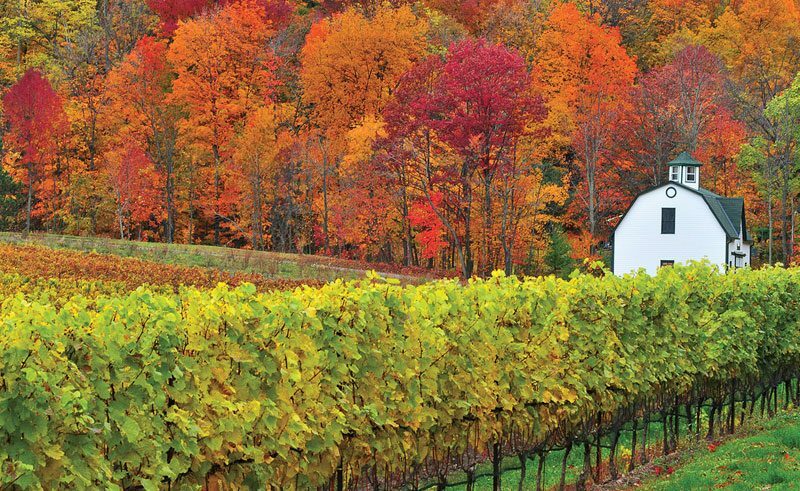 You can visit the neighbouring areas of Niagara Falls and the quaint Niagara-on-the-Lake, and sample some ice wine in the wineries on the way. Blue Mountains is near enough for a skiing trip, or try some snowshoeing out at the Scenic Caves Nature Adventures. Barrie offers husky sledding. There really is something for everyone – Toronto is not just another city break! Does Toronto take your fancy? Get in touch Emma-Louise direct for more travel tips or make an enquiry online.